The Real Reason Empaths have Heightened Emotions and Ways to Calm Them? Although emotions are part of human life and something everyone has to live with, Empaths and HSPs are known to have heightened emotions. This basically means they get upset easier, feel fear and nervousness more readily, and when they get down it can take them longer to get back up… But did you know there was a reason for this? There is a certain part of the brain called the amygdala which plays a part in emotional overload. Dr. Elaine Aron, a research psychologist, found the amygdala to be highly activated in Sensitive people. The more Sensitive you are the more this gland seems to work. The amygdala is a set of small almond-shaped clusters of nuclei, located deep within the brain’s temporal lobe, which plays a huge part in processing emotions. The more aggressive the emotion the more responsive the amygdala becomes, and is responsible for triggering the stress response hormones. Dr. Aron found, through a series of trials and research, that when Sensitive people (Empaths and HSPs) were shown pictures of human suffering the amygdala became highly activated. Which in turn released hormones, such as cortisol and adrenaline into the bloodstream, which further enticed emotional responses. The amygdala is not a thinking part of the brain. It is a reacting part which activates when exposed to stimuli such as stress, fear or other strong emotions. It causes an automatic response known as the fight-or-flight response. The fight-or-flight response is the body’s way of protecting us from dangerous situations. The process elevates hormones to give the energy and strength to run away from danger or stay and fight. Two of the hormones released into the body, by amygdala activation, are adrenalin and cortisol. These hormones increase heart rate, respiration and glucose levels. All of which are essential for increased body activity. But, they can also ignite fearful emotions and anxiety. When these hormones are constantly activated by the endocrine glands (courtesy of amygdala activation), and not used through body movement, etc. it can cause heightened emotional responses. This eventually puts other organs and hormones out of balance and leads to illnesses (such as heart disease, adrenal fatigue and diabetes), as well as problems within the energy body (leaky aura and blocked or excessively open chakras). An Empath does not need to watch another endure pain to experience suffering. Simply being in the presence of someone suffering emotionally is enough to ignite a reaction, whether the other person shows their emotions or not. An Empath feels them and therefore reacts to them. This means the Empath often overproduces adrenalin and cortisol. Both of which stimulate fearful emotions and can lead to weight gain (another reason many Empaths have pot bellies). In normal situations, when a stressful situation is removed stress levels return to normal, and the amygdala stops reacting. It is when the stress triggers do not decrease that problems arise. This is where issues can occur for the Empath. The Empath may stop feeling other people’s emotions soon after leaving them. But this is not always the case. Some people’s emotional energy can cling to the Empath for days after (see this post to learn more). Which means the amygdala is constantly activated and large amounts of unnecessary hormones are dumped into the body. The first step we can take in preventing unnecessary amygdala activation is to avoid known triggers. The people you know who stimulate a negative emotional response (see post here) lasting more than a day should be avoided. The amygdala is a defence mechanism activated by emotional responses. It can also be triggered by emotional memories. People who bring nothing to your life but emotional pain eventually become an Empath trauma trigger and should probably be avoided. Sensitives react to coffee and other stimulants more than most. It is best to know your caffeine intake limits and stay within them (take note at which point you get a physical response – too much caffeine can cause shakiness, pounding heart, flushing, faster breathing and an aching chest – and stay under the that amount). Also drug-like food has a huge impact on an Empath brain (read more about this subject here) and should be avoided. Exercise has many redeeming benefits for the Empath. In the case of amygdala activation, it helps clear excess stress hormones from the bloodstream (which would otherwise cause damage). Regularly experiencing stressful emotions, your own or off others’, results in extra glucose being dumped into the bloodstream (from amygdala hormone activation), the last thing an Empath needs is their diet to contribute to this problem. Avoiding sugar or sugar-forming foods can prevent this from happening. If you are one who carries excess belly fat, your body is receiving too much glucose for its needs. If you want to learn more about how the right diet can transform an Empath’s life you may want to read this post. I hope this blog post helped you understand how your brain plays a vital part in your Empath wellbeing, and how the amygdala’s activation impacts your emotional health. If you want to learn more about the ways Empaths are affected by the energy of others click on the attached links above. Never Miss A Post! Join Thousands of Others on This Amazing Journey of Transformation! Anyone who has read many of my posts is probably aware that I’m a big advocate of taking responsibility for self-healing. When it comes to finding balance and realigning the mind, body and spirit, I believe we are the ones who are responsible. We must make the changes. It is after all our journey. (Of course I am not talking about serious health conditions, that need medical assistance). I wasn’t always of this mind. When I was younger, I hoped others would do it for me. I wanted the easy option… I learnt the hard way on that one. It was over 20 years ago when I started looking for answers to the mysteries of life. And in that time I have made many discoveries. Especially in regard to Empath life! It took me a while to see it, but although it comes with many challenges, the journey of an Empath is a brilliant fast-paced rollercoaster ride and a true blessing. If it were an easy comfortable trip we would never get to overcome the many obstacles we do. And, in turn, accomplish and learn so much. We climb mountains, float on clouds and stumble into darkness, sometimes all in one day, and it is these experiences that make the Empath journey so worthwhile. I have by no means got the answers to life’s mysteries, nor would I yet want to have. We have to leave something to learn on life’s path. However, the most important detail I have realized to date is: we will never find true health, peace or happiness until we heal the trinity of mind, body and spirit. We come as a trinity package and when it comes to healing we generally have to work on all three. We heal the body and mind through eating the right diet, drinking plenty of water, doing a good amount of exercise, avoiding excess amounts of stress or anything that is harmful to us. We heal the spirit by living authentically, expressing gratitude, being kind, having a spiritual practice/belief and spending time in nature. Generally, when the body is in balance the mind and spirit very quickly follows. The biggest cause of physical imbalance is the diet. It won’t matter if you work out five times a week, or if you have a regular spiritual or meditative practise, if your diet is unsuitable you will be out of balance and you will struggle with Empath life and your trinity will be out of sync. Eating foods that do not agree with you will weaken your body, disrupt your hormones, cause mental imbalance and contribute to leaky aura (seriously bad news for the Empath ). I had no idea that what we put in our mouths could have such a harmful effect on our all round physical and mental health, as an Empath, until I changed my diet. The start of my Empath transformation began in 2012 [see post here ], when I started making changes to what I ate. By removing certain foods, I found life as an Empath became easier and more enjoyable, and my intuition and happiness increased. I was shocked that the wrong diet had had such a negative impact on me. If you are an Empath and you have suffered for a long time with niggling health problems like allergies or depression, if you struggle spending time around people, or if you experience crushing fatigue or brain fog look at your diet. Modern diets and lifestyles have taken too many Empaths and Sensitives down. Putting them out of action without them realizing that their diet is preventing them from becoming all they can be. If you want to see BIG changes in your life, change your diet! Now is the perfect time to make changes, to start living, not just existing, and get doing what you came here to do, and that can be done through healing the trinity of mind, body and spirit. 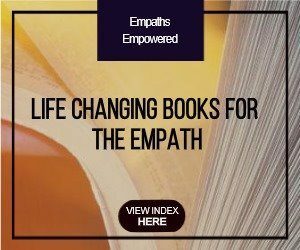 2017 Update: If you are interested in changing your Empath life, this book will help you. Or to check your symptoms click on the link: Empath symptoms. Hope this helps on your journey! Want to Know One of the Worst Things for an Empath? Over the years, I have tried and studied numerous types of holistic healing. I have researched the benefits of food and nutrition on physical and mental health, and how it affects Sensitive people. Through this, I have made many incredible discoveries. One of the biggest realizations I have made from observing life and all my research, is how different each and everyone of us is, even as Empaths. Sadly, we live in a world where we are all expected to be the same in the way we behave, look, think and live. We are encouraged to have the same goals, expected to respond and benefit from the same educational programmes, nutritional and medical advice. Even in the ‘New Age’ arena it can be a one-size-fits-all and an ‘it worked for me so it should work for you’ approach. But this is not how life works. Some Empaths need speeding up, some need slowing down, some will benefit from a high protein diet, some a high carbohydrate diet, some need to get out of their heads, some need to get inside their heads, and some need routine and rules, others need space and freedom. Because we are different in so many ways, the path for us to connect our mind, body and spirit is unique to us. But it is also up to each of us to work at finding what is best for us individually. We may think we want the easy path but, as you will probably have already discovered in life, the easy path rarely ends up being easy. Great, amazing and valuable lessons can be learnt from enduring difficult and challenging times. On my early journey of finding balance, as an Empath, I used to believe the answers to my healing lay in the metaphysical. I thought if I made myself more ‘spiritual’ I would better deal with all that I felt and thus become more balanced… I hadn’t taken into consideration that it didn’t matter how many hours I sat in meditation, doing yoga or how many spiritual texts I read, if I was putting poison into my body, no amount of meditation or spiritual awareness was going to balance me. I made this discovery when I decided to change my diet. And the first change I made was by eliminating wheat… This was the start of an incredible life transformation! I lost weight without trying, I felt happier, my energy changed and I took charge of my Empath traits. Although wheat is hailed as a health food, it acts like a drug and has been scientifically proven to have a drug-like effect on the brain. Wheat has been linked with hundreds of mental and physical illnesses, Click here to check any of your symptoms against those found to be caused by wheat. and it heightens the more ‘negative’ Empath traits. Now, although I say we are all different as Empaths and each need differing approaches to find balance, none of us will benefit from consuming drug-like foods. Empaths react more to drug-like foods because they are highly reactive. High reactive people taste the bitterness in lemons more than others, feel emotional and physical pain more, go red in the face easier and are affected by drugs and alcohol worse than those who are not highly reactive. Wheat is not seen or classed as a drug but, as it acts like one, it carries the same energy signature. Many Empaths are under the impression that most of their mental and physical maladies are caused from absorbing too much negative energy when, in fact, many are caused or worsened by what they consume… especially drug-like food. No one benefits from eating drug-like foods such as wheat! You may not be aware but wheat has been genetically altered and its protein structure changed. Now, when digested, wheat breaks down into many small proteins that have the ability to cross the blood-brain barrier and attach themselves to the opiate receptors of the brain. This has the effect of a narcotic but without the high. Wheat has been shown to encourage overeating and trigger or worsen mental illnesses. Not only is wheat destructive to physical health, by its consumption we can damage our energy field (causing leaky aura) and disrupt the balance of the chakras and endocrine glands (glands that produce hormones). The following post explains more on how unbalanced chakras can destroy the Empath. If you are one who has tried many things to find balance as an Empath, such as: grounding and protective techniques, meditation and spiritual practice and exercise, or if you eat a balanced or vegetarian diet and still struggle with health issues, low moods or depression, look to see if you are including wheat in your diet. I appreciate others may not have the same benefits as me from wheat elimination. We are all different. But it is worth trying it for at least 4 weeks just to see. If you want to try going wheat-free or if you want to transform your life as an Empath, The Eating Plan For Empaths and HSPs will take you there. It goes into detail about how certain foods impact you as an Empath and how by changing your diet it can transform your life. Click on the above link or the picture for more information. Why Not Transform Your Empath Life for Good? It may sound like a cliché statement to make, but if you change your diet you really can transform your Empath life! Last year (2012), I eliminated wheat from my diet. It is one of the best things I have done for my health and Empath wellbeing. It was through this that I discovered how great a part diet plays on Empath traits. I have already written about the devastating effects wheat has on the body and mind. And, after more in-depth research, I will expand on the reasons behind this and take a look at how wheat and gluten is being linked to many diseases, and how it affects the way Empaths interpret the emotional energy of others. Every Empath will benefit from removing wheat, and even gluten, from their diet. Especially if they suffer from any kind of depressive illness or if they are introverted to the point of not wanting to venture out into the world. Click here to check any symptoms you may have against those caused by wheat. The wheat you consume today is nothing like your grandparents feasted on. It is now the product of genetic manipulation and these changes began as far back as 1935 when genes for semi-dwarf wheat were first bred. Dwarfing the wheat genes enabled greater seed production. And, because dwarf wheat only grows to a height of two feet, instead of the usual four, it made it less prone to wind damage. By the 1970s this semi-dwarf wheat was being successfully farmed in Mexico, India and Pakistan. By 1985 much of the Western world was producing semi-dwarf wheat and by 1997, 81% of the developing world had introduced this crop. Although the sole intention of genetic crossbreeding of wheat was to give greater yield, thus ending world famine, it changed components of the wheat protein known as gliadin, which caused many problems to the human body. Gliadin is a lectin and a part of wheatgerm and gluten. Lectins are proteins that are found within plants and animals; they do the same job of antibodies within the human body, fighting off foreign invaders such as bacteria. Stomach acid has little effect on lectins – they are virtually indigestible! So, if a person has consumed wheat, the lectins move into the intestines undigested. The intestinal tract knows exactly how to filter waste and extract nourishment; it knows toxins and bacteria from the nutrients our bodies need to feed its cells. Lectins have the capacity to switch off this filtering system and disturb the intestines ability to act as a filter. The colon then becomes permeable or leaky and allows toxins into the body that have no right to be there. These toxins wreak havoc on our physical systems and show up in any part of the body as: inflammation of the gut, bowel disease, arthritis, dermatitis, depression, anxiety, acid reflux, asthma, eczema, inflammation of the organs, imbalance in the endocrine system (system which secrete hormones into bloodstream), chronic fatigue, weight gain/loss and joint pain. But the above ailments are just the tip of the iceberg. And, for the Empath, lectins can heighten all their negative traits and supress the positive. Another symptom related to the changes in wheat is the plague of depression that has been on the rise since the mid eighties; coincidentally around the time genetically mutated wheat became abundant and a staple at every meal. In the 1950s it was estimated that no more than 50 to 100 people out of a million had the need for antidepressants; that figure stands today at 1 in 10! More than 40 million people worldwide are now taking antidepressants. According to The National Centre for Health Statistics, in America alone, the use of antidepressants increased by 400% between 1988 and 1994 and numbers have continued to escalate since then. It has been scientifically proven that wheat can change your personality and behaviour! In tests, wheat was put through the process of digestion. It was found when wheat broke down, during digestion, it did so into many small proteins. These small proteins had the ability to cross the blood-brain barrier and bind themselves to the opiate receptors of the brain, having the effect of creating behavioural changes such as paranoia and depression. The opiate effect of wheat is similar to that of narcotics, but without the pleasurable high and is addictive. So addictive in fact that it will give withdrawal symptoms soon after elimination. An Empath is sensitive to anything of a narcotic nature. They are also prone to experiencing depression or heightened negative emotions, simply by being around anyone who is suffering. Consuming wheat heightens any negative emotions they experience, both their own and those they pick up. The last thing an Empath needs is to be brought down by their food. This is why they will benefit from wheat elimination. To some, the notion of giving up wheat (bread, cakes, pasta and pizza) fills them with dread, even anger, that is just an addiction talking. Once eliminated from the diet, the desire for wheat foods disappear completely. For some it may take days for others a couple of weeks. However, the addiction will return if wheat is reintroduced, as well as some other nasty effects. (Update 2017) I believe so much in the power of diet change for an Empath I have written a book about it. If you too want to see big changes in your health and happiness, and I mean changes, why not read The Eating Plan for Empaths & HSPs, it might transform you Empath life! The majority of Empaths have no idea how much tension they hold within their bodies. Most unknowingly have their muscles in a constant state of contraction, and, because of this, even in sleep, they don’t fully relax… Which leads to extra Empath stress and overwhelm! Your muscles are constantly stimulated, through the stresses of modern life and also through vigorous sports and exercise. Even the TV programs, watched of an evening to relax, have an effect of firing up the mind which stimulates the muscles, further tensing them. Also, painful emotions, either your own or those you pick up from others, are stored within the muscles, leading to greater muscle fatigue. Stressed Muscles Leads to a Stressed Empath Mind! Did you know, even now, whilst reading this, you are holding tension somewhere in your body? If you take your awareness to your face you may notice that your forehead, jaw or eyes are not relaxed. If you travel further into the body you may find your shoulders hunched or your wrists extended back, your legs, hips or back might be in an awkward or unnatural position, all creating pressure in the muscles and joints. But, until this was pointed out, you were unaware you were holding any tension. We could go through the entire body, but I think it’s safe to say you will be unwittingly holding tension somewhere. When your muscles are constantly contracted, they are fuelling the sympathetic nervous system (fight or flight). Not only is this depleting the body of vital energy, that most can ill-afford to lose, but it is also prematurely ageing, it raises blood pressure and lowers the immune system and unnecessarily heightens Empath stress. By training the muscles to soften and loosen, through relaxation, it switches on the parasympathetic nervous system. This, in turn, slows the breathing, lowers blood pressure, initiates deep relaxation of body and mind, and allows healing to occur. In yoga, it is known that the relaxation, at the end of a class, is the most beneficial part of the practice. Not only is it time for the body to rest but it’s the time the benefits of practise are fully integrated. One of the best and easiest ways to get a muscle to relax is to tense it first. If you’ve ever been in a yoga class and the teacher asked you to tense your muscles before relaxation, it was to help you drift into a deep relaxation. Lie on the floor or a bed (for anyone suffering back problems: a bolster or cushion under knees is helpful). Starting at the feet, tense them for five to ten seconds then release. Work up through limbs, torso and face, tensing and relaxing each body part in turn (great if you can’t sleep) and then, when you’ve tensed each body part, allow yourself to let go. Stay for a while in this deep state of stillness. If time is short, you could tense the lower part of body first, then the upper half, finishing on the face. Not only does the above exercise promote relaxation but it also aids in stilling the mind. Relaxation can be done at any anytime of day but it is great to do at bedtime or after exercise. Also, if you are suffering a lot of emotional stress, you may find this post on Essential Oils for the Empath beneficial. Or visit this post to discover how yoga can help you as an Empath. If you are looking for a book with the best ways to find balance as an Empath, why not read an excerpt to see if this one is for you? If you are an Empath, you will know, only too well, how easy it is to pick up coughs, colds and other ailments off those we spend time with. Empaths often get twice as many ailments as those who do not pick up the energy of others. So, why is that? An out of balance Empath, especially one who has absorbed the stresses of others, as well as having their own to deal with, need only briefly be in the presence of someone with the beginnings of a sniffle to pick up a full-blown dose. Of which, the ensuing symptoms tend to be worse than the original carrier. The problem is, many Empaths are not aware of their own imbalances. Some become so used to feeling ‘out-of-sorts’, after picking up stress from others, they do not notice their body becoming weaker and their immune system less resilient. I have discovered the best way to stay in balance, as an Empath, is to have all bases covered. And what I mean by that is to take care of our physical, mental and energetic bodies (body, mind and spirit). In this post I am focusing on balance of the body (immune system) in the way of supplements. Heard of the saying: ‘like attracts like’ or ‘like increases like?’ Well, it works in all areas of life. Generally those who regularly pick up the negative emotions of others, often feel like crap. When you feel crap you want to eat crap: fast food, stodgy and sugary food. Basically the type of food that has little in the way of nutritional value. So you feel rubbish, eat rubbish, feel more rubbish… and get no nutrients. Nutrients are our safeguard against illness because they help keep the immune system strong. I came to realise, firsthand, the importance of supplements, through unintentional trial and error over the years. In my haphazard approach to taking vitamins and minerals (taking them for 6 months then non for the next), I found that when taking supplements I had far less immune-system-related illnesses than when not taking them. There is much controversy over the effectiveness of supplements, especially synthetic ones, and whether they actually work. Many experts argue that a healthy, balanced diet is all we need for optimum nutrition levels. But, even with the healthiest of diets, do we really know how nutritiously balanced our food is? It is known that our soil is no longer rich in minerals, as it once was, which ultimately affects the mineral content of the fruit and vegetables grown in it. The ripe and brightly coloured fruits on our supermarket shelves may have travelled half-way around the world, and are already months old, before they get to our kitchens. Meaning a much lower vitamin count than if delivered to the supermarkets within hours of being harvested. It is easy to get reliable information on the web regarding supplements and their benefits. And it is well worth doing the research. A good multi-vitamin and mineral. Extra Vitamin C and Zinc (especially if you get many colds). Omega 3, found, for example, in fish oils or organic coconut oil (a diet consisting of a ratio 3-1 of Omega 6 to Omega 3 is a good balance. However, the average Western diet consists of a ratio of about 15-1 or more, through the high usage of vegetable oils in processed foods). Acidophilus (especially if you suffer from a sensitive digestive tract). Vitamin D3 (more for the darker, winter months). Digestive Enzymes (to be taken with meals) which help break down food and extract the nutrients. Especially beneficial to those who suffer with indigestion or low stomach acid. Magnesium Many people are deficient in magnesium. This mineral is especially beneficial to anyone suffering anxiety, muscle aches or constipation. If you have any underlying health conditions, speak to a health practitioner before using supplements. I write these posts with the intention of helping Empaths help themselves. But we need to take responsibility for self. What works for one won’t always work for another. So in that respect take what feels right to you and discard the rest. Empaths tend to get that ‘gut feeling’ (the knowing) when something is not right. Click on the picture opposite if you want to discover how your diet affects your Empath life and how, by making some simple changes, you can transform your life. What is Your Empath Dosha Type? Empaths tend to be hardwired for learning and are often on the lookout for new ways to help them find balance. By discovering your unique dosha type it could be that last piece of the puzzle you were looking for. I have long been an advocate of the healing powers of yoga on the body and mind. So much so, I trained as a yoga teacher. A part of my yoga teacher-training was devoted to the study of Ayurveda: an ancient healing practice and sister science to yoga, in which we discovered how our body constitutions, known as the doshas, affect our lives. The meaning of Ayurveda roughly translates to ‘the science of life’. Its aim is to bring balance and health to both body and mind. This is achieved through various Ayurvedic methods. But one essential element is discovering what our dosha type is. Each individual dosha type determines how and what we should eat, what type of exercise is more beneficial, it even determines our temperments and the emotions we are more prone to experience. Each of which can affect how we show up in the world as Empaths! 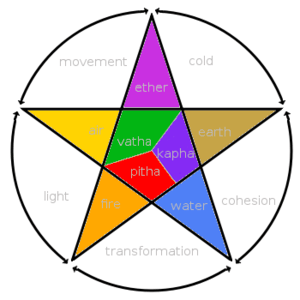 It is said we are all born with one basic constitution (dosha) which are known as either: Kapha, Pitta, or Vata. 80% of us are born with one primary dosha and the other 20% will have a dual-dosha or even tri-doshic type. A diet consisting of lower-fat, low-sugar, no-wheat products and plenty of spicy food is recommended. A diet consisting of sweet, warm, moist and oily foods is recommended (not processed food though). It goes against the grain of what the Western world promotes, in that the same healthy diet is beneficial to all. A food which is incredibly healthy for one dosha type, may not be so good for another. I have included a link further down for you to discover your own unique dosha type. So how does this information help an Empath? Finding your dosha certainly won’t take away your Empath woes. But when we discover what is best for our individual doshas it is another step towards overall balance. Empaths take on so much and can spend much of the time feeling exhausted just from dealing with external energy. But if we know that we have balanced our body, mind and spirit through eating, drinking and exercising according to our type it will make life easier and happier. Also by finding your dosha type it will help you understand to which emotions you are more prone. Which will ultimately help you navigate your way through life! These days we can not afford to get ourselves any more out of balance than we already are. If we are not physically in shape and are not doing what is best for our type then it leaves us vulnerable. On some days just putting one foot in front of another is a real effort and thinking about any kind of self-improvement is hard work, but if we find balance those days will be few and far between. We should not suffer unnecessarily. Chopra Dosha Quiz A questionnaire which will determine which type you are. When answering the questions it is best to cast your mind back to late childhood and early adulthood, because this is when you were most likely your true dosha type: before you got imbalanced from a stressful lifestyle, wrong diet and exercise et-cetera. There is a wealth of information on both websites about your dosha type and what foods to eat, or to avoid, to balance it/them. You can also discover how much exercise is beneficial to your type and whether eating your food hot or cold should be a consideration. If you get chance, visit an Ayurvedic practitioner who will give you a reliable diagnosis of your dosha type. 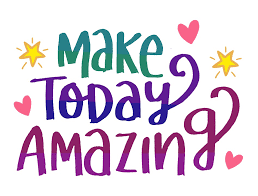 Hope all is keeping amazing in your world!